If﻿ y﻿ou use a ramp, tow the 'van forwards onto the ramp, & don't reverse onto it. Slight thread drift but, my experience of pulling van forwards onto ramps etc, is that, as soon as you unhitch, the van moves back a couple of inches on the ramp side, as the auto reverse system sets. Conversely reversing onto the ramp has never given any issues. My experience exactly. Reverse up. May I point out that I said of club sites "you'll﻿ generally find their hard standings quite level"? I accept not 100% of them are level and I was not stating they were. Since new year we have been on Rally’s on 2 different CMC sites. It was interesting that on either site I couldn’t see any “normal” customer had used a ramp to level a van but about half to 2 thirds of the Ralliers had. This might of been conincidence but actually I think it was because levelling a van is part of a the pitching routine. For us the first thing that we do on arrival is to get the spirit level out to check for side to side level. 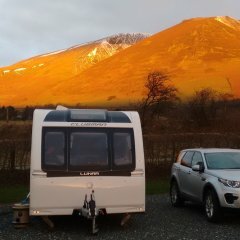 @ OP you may find that your caravan works best if it is slightly off level ie water drains from the sinks and the shower better. So don’t get to hung up about getting it perfectly level. As the yellow ramps referred to in this thread leave the caravan wheel on a slope I don't use them. If you want to splash out a bit more cash you could get this https://www.locknlevel.co.uk/ I've got one but not used it yet. The Trugdens rate it. I want the single axle version, but I just know if I buy one the chances of it coming out the box will be practically nil. Over 7 years of caravan ownership I think I've levelled twice, once this year and the other must be 6 years ago. When it comes to pulling forward or reversing onto a ramp. For me it depends how I feel on the day! But seriously I have never heard of anyone actually coming off a ramp particularly if you chock the wheels. As said before we use a ramp probably 50% of the time. I have a set of these, which used to be sold in the UK under a different brand. Perfect for use with an alko lock. I understand your concern but generally ramps are fine to use, with the proviso that the wheels are adequately chocked. The yellow ones I've got come with chocks that 'lock' into the ramp, very secure, hold a 2 tonne caravan with no issues. I always used the yellow plastic ramps, reverse a bit further then pull the caravan onto it until it's level, before unhitching from the car I used the second ramp (upside down) as a chock, it always worked well over the last 20 years. I hate an uneven caravan and we found that some of the gravel pitches ran out of true a bit so we used them quite a lot. Last year we bought a twin axle & it all changed........ After struggling with one ramp at the front and a cut-down ramp inbetween the wheels, various bits of wood and all, we bought one of the Lock & Level airbag systems. I tried it out on the drive and it's brilliant. Not cheap at around £200 for the twin axle version, but oh-so easy. I made my own for my TA out of old decking, or a new one would be around £25 , two decking boards and some screws from Wickes. +1 for off cuts of old decking and scaffolding planks. I've a twin axle, and have Alko locks already (so don't wish to duplicate a purchase of others), which method / technique and equipment would you recommend. I'm about to go away for a week in the van onto a fully serviced grass pitch, so assume it will be pretty flat. I'd also prefer not to shell out £200 on the lock and level right now. 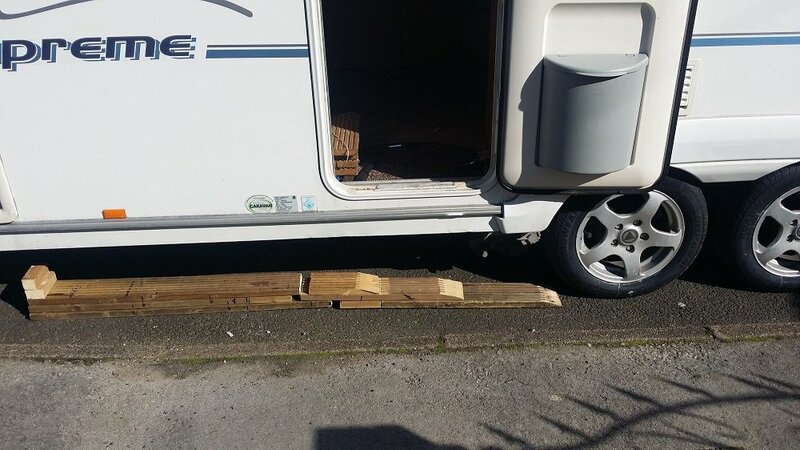 Regardless of whether a levelling ramp is needed for side to side levelling, once one wheel lock is fitted, the only issue will be to align the second wheel with the lock for fitting, You'll probably have to jack the caravan up on one side and rotate the second wheel by hand, so for your own safety as the caravan brakes will need to be released, I suggest this is done while the towcar is still attached. Once both locks are fitted (on the same side) apply the caravan brakes, chock the wheels and unhitch from the towcar. Then level fore and aft using the jockey wheel adjustment and finally lower the four corner steadies.